Drawing of an area to the east of Folstone in Kent, showing Hawkinge and West Hougham. 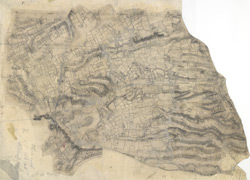 Dense brushwork interlining ('hachuring') is used in this plan to indicate the contours of the land. Wavy lines indicate woodland. Compared to the later surveys, this drawing is very crude, suggesting it is a preliminary sketch taken in the field.